Markets – competitive bidding between buyers and sellers which determines what is produced and consumed. Command Planning – a centralised bureaucracy collects information and decides on a plan for what is to be produced and consumed. Democratic Planning – workers and consumers cooperatively create and approve a plan for what is to be produced and consumed. Within worker councils, decisions are made democratically, jobs are balanced for empowerment and desirability, and any differences in income are due to different levels of effort people choose to expend, in addition to any special needs allowances they may receive based on decisions in their consumer councils. A Participatory Economy needs an allocation system that complements these institutions. Allocation in a participatory economy cannot be done via competitive markets or command planning since they are not consistent with the goals or values stated earlier. Therefore, allocation in a participatory economy is conducted via a unique democratic planning procedure, called Participatory Planning: a decentralised process, whereby councils and federations of workers and consumers make and revise their own activity proposals, over a series of rounds, leading to the creation of a feasible, efficient and fair plan. This annual procedure takes place in the context of longer-term investment and development plans that have already been agreed upon. This means that the supplies of capital goods and different categories of labor available for use this year, and the amount of new investment goods to be produced are already known when the annual planning process begins. In a participatory economy every worker belongs to a worker council where they take part in formulating the workplace’s production proposal for the year ahead. Worker representatives are elected to wider worker federations covering whole industries. Every citizen or family unit is also a member of a neighbourhood consumer council. This is where they submit their personal consumption requests, participate in discussions about what local public goods to ask for, and vote for recallable representatives to higher level federations of consumer councils at the ward, city, state, regional, and national levels. The Iteration Facilitation Board (IFB) is made up of workers whose role is to facilitate the flow of information during the planning process. IFB workers update prices (estimates of opportunity and social costs) of all inputs and outputs from round to round based on an agreed set of rules designed to reach convergence of a coherent plan, explained in more detail below. It is important to note that those who work at the IFB do not have any discretionary powers and could in theory be replaced by an algorithm. 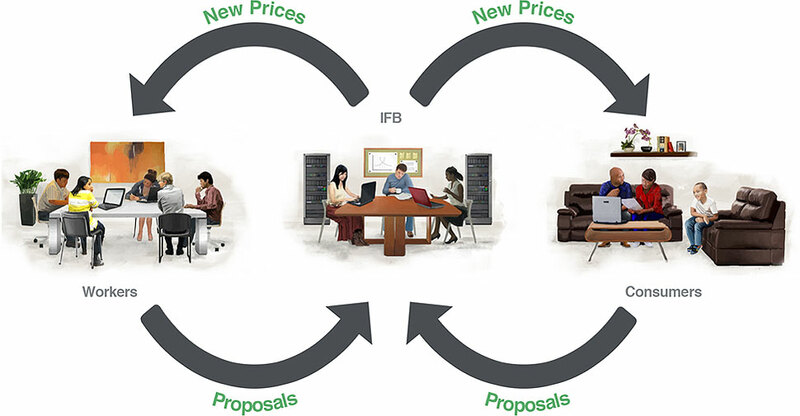 The IFB announces prices, which are simply current estimates of the opportunity costs of natural resources, categories of labour, and capital stocks, the social costs of producing different goods and services, and the damage caused by different pollutants. These ‘indicative’ prices signify estimates of what it costs society when we use different resources, emit different pollutants and produce different goods and services. In addition to this, descriptive text may also be included, providing councils with further information that cannot be captured by the numbers alone. Using the indicative prices, consumer councils and federations submit proposals of what goods and services they wish to consume. Worker councils and federations submit production proposals of what goods and services they will produce, including any pollutants created as by-products, and the inputs they need to use in order to carry out their proposal. The IFB updates the indicative prices up or down in proportion to the degree of excess demand or supply. The above process repeats itself over several rounds or ‘iterations’ – with each round providing ever more accurate information on the estimates of opportunity and social costs based on how all actors’ choices and desires impact on others – until there are no longer any excesses in supply or demand i.e until a realistic and mutually agreed upon plan for the year is attained. As described, during each iteration, every worker and consumer council and federation submits a ‘self-activity’ proposal of what they intend to produce or consume for the year ahead. The proposal requires approval by other councils and federations, who simply vote yes or no on whether to approve the proposal or not. But on what basis do councils determine whether to approve others’ proposals? The participatory planning procedure is designed precisely to provide the necessary information to enable workers and consumers to make it clear whether proposals made by others are making use of scarce resources responsibly and whether requests made by other consumer councils are fair. 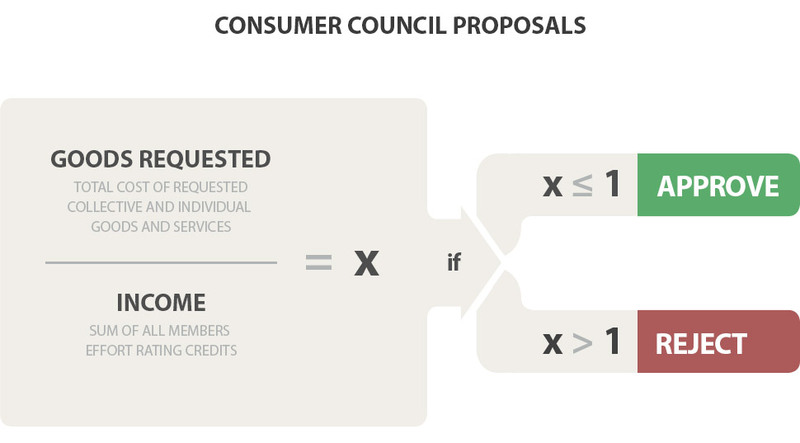 Consumer councils and federation proposals are evaluated by multiplying the quantity of every good or service requested in the proposal by its indicative price (estimated social opportunity cost). This total is compared against the average effort rating plus any special allowances of the members for the consumer council or federation making the request. For example, if a consumer council’s average effort rating is equal to the social average, they are entitled to consume goods and services equal to the social average. Neighbourhood consumption councils whose members have made greater than average sacrifices are entitled to consume goods that cost more than the social average, those making less than average sacrifices must consume goods that cost less than the social average. 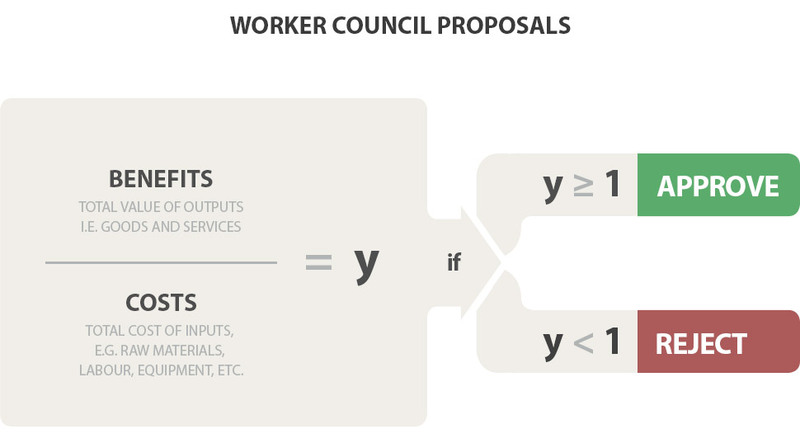 On the production side, worker councils’ proposals are evaluated by comparing the estimated social benefits of its outputs to the estimated social costs of its inputs. These totals are calculated by multiplying the quantities of inputs and outputs by their prices, including negative prices for proposed pollutants. This information is used to calculate the social benefit to cost ratio of each worker council proposal. If the social benefit to social cost ratio is above one, the council has proposed to use resources belonging to everyone responsibly, and everyone is better off by approving the proposal. The information generated during the planning procedure makes it quick and easy for councils to know whether the requests they and others are making are fair or not, efficient or not, and therefore whether or not to approve the proposals of other councils. Public goods are goods that are consumed collectively by groups of people. This could be small sized numbers of people in neighbourhoods or larger groups in cities or even covering the whole society. For example, a neighbourhood gym, public transport in a city or public education for everyone in society. The cost of the good or service is borne by those consuming the good leaving them with less available for personal consumption. One important distinguishing feature of participatory planning is that requests for collective consumption, through consumer councils and federations, are just as easy to make as requests for individual consumption. In neighbourhood consumption councils, members meet to discuss, propose and vote on the level and composition of neighbourhood public goods consumption. Federations responsible for different levels of collective consumption – and limiting pollution levels – at higher levels from city, regional and national level, are also governed by democratic decision making procedures where each council in the federation sends representatives to the higher level. Representatives meet to discuss what public goods larger groups of consumers want to request during each round of the planning procedure. It’s important to note that these are all meetings within councils and federations and that these meetings are only concerned with what they want to do themselves, not what others should do, thus avoiding many potentially time-consuming and arduous deliberations. Consumers requesting more than their effort ratings warrant will need to either reduce the amounts they request, or choose other items which are less costly. Workers will need to either increase their efforts or change production towards producing more desirable outputs, or using less costly inputs. In each round, estimates become more accurate, moving closer to true opportunity and social costs. It is also important to stress that if a proposal is not approved, the council that made the proposal and no-one else is responsible for revising its own proposal for resubmission in the next round of the planning procedure. This is another aspect that sets apart participatory planning from all other planning models – and is crucial for having meaningful self-managed democracy. In contrast to market economies, where producers guess and try to influence what consumers will demand (resulting in tremendous economic inefficiency, recessions and waste), a participatory economy is a planned economy whereby consumers are asked in advance what they expect to consume in order to help create a plan for the year ahead. However, this does not mean consumers are expected to know everything they will want in detail. Proposals for private consumption are just best estimations of what they think they will want based on choosing from a list of ‘coarse’ categories, such as shoes, bicycles, computers, etc. The whole process will likely only take the average person very little time, looking at their consumption from the previous year and making adjustments up and down where necessary. Some requests will be more accurate than others in their estimations and consumers will need to make changes throughout the year. Each consumer could have an electronic card that is charged whenever collecting goods and using services. The consumer could be prompted whenever deviations are expected to occur if they want to make a change. This information can be recorded, and, using technologies such as inventory management and real time supply chains, can be used by consumer councils and federations to coordinate changes. Some changes will cancel out across federations whereas other adjustments may require discussion with industry federations of worker councils. Participatory Planning is a social process whereby workers and consumers, through their councils and federations, co-operatively arrive at a plan for an economy that is fair and efficient, whilst adjustments are made during the year. It is a very different way of distributing goods and services compared to competition based market economies and centrally planned command economies. We have outlined participatory planning, but many more questions arise that are not answered in this short presentation and we encourage readers to explore further material under ‘more’ including aspects such as international trade, ecology, innovation, as well as the ‘links’ page where readers can find links to videos, audio, articles and books providing more in-depth information. Readers interested in more technical presentations of participatory planning are recommended to see The Political Economy of Participatory Economics, Princeton University Press, 1991.